cafe gratitude in larchmont village hasn’t been open very long, and it’s already one of the best spots to eat in los angeles. 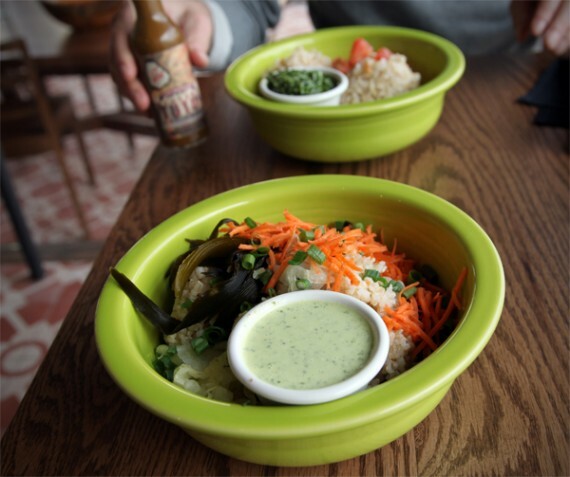 the almost all vegan restaurant (one of their drinks contains honey) has a massive menu with something for everyone—raw food, cooked food, gluten-free stuff, salads, soups, tacos, sandwiches, bowls, booze, desserts, you name it! i hit up the small restaurant a couple nights ago for dinner with my friend milque, and our meal was fantastic. the cafe bustling, service was friendly and the food was delicious. i’m gonna spoil this blog post by starting with dessert, because it was honestly the highlight of the evening. as we’ve mentioned before, the menu items at cafe gratitude are all named with positive affirmations. while it makes for a somewhat awkward ordering process, the food doesn’t suffer, so i can’t complain. for dessert we got a slice of “i am adoring”, cafe gratitude’s vegan tiramisu, which was shockingly good. i’d heard people rave about this cake before, but i wasn’t prepared for its awesomeness. it was perfectly spongy with layers of creamy coffee-flavored frosting and a dusting of cocoa on top. 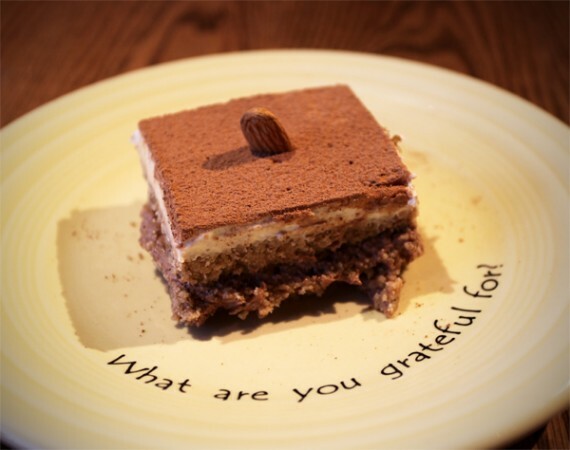 if you haven’t tried it yet, the tiramisu alone is reason to check out cafe gratitude. cafe gratitude is open, and we love it! 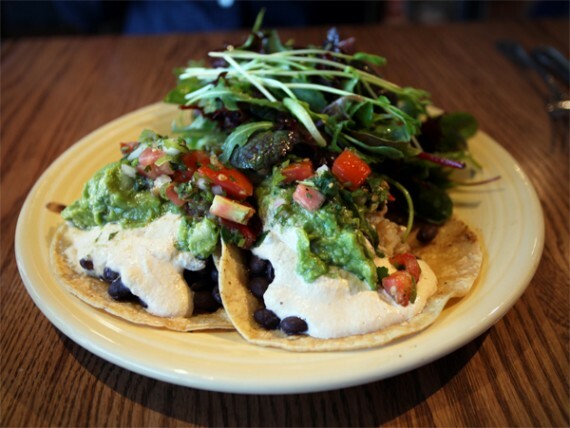 last week we blogged about the opening of LA’s latest vegetarian restaurant, cafe gratitude. well, we finally made it there for a meal over the weekend and we were impressed! the brand spankin’ new larchmont village eatery is almost entirely vegan (other than one honey-containing drink, according to our server), and has a huge menu full of raw and cooked appetizers, entrees, desserts, smoothies…even beer and wine. from uber-healthy salads, to decadent “cheesy” potatoes and rich desserts, there’s something for everyone at cafe gratitude. los angeles vegans, rejoice! cafe gratitude is opening today in larchmont village! 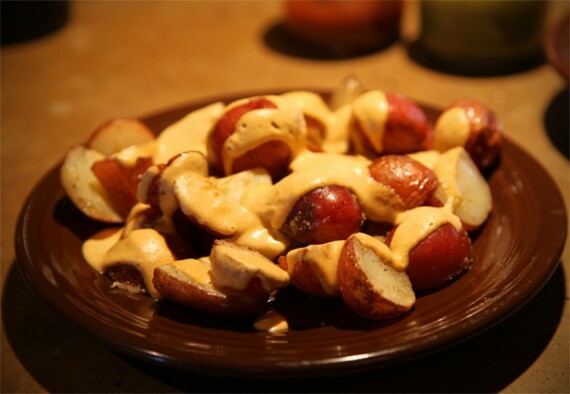 vegan cheesy potatoes will be there! the vegetarian restaurant chain (almost entirely vegan, but some menu items contain honey), is already a huge hit in the bay area and we are so happy they’ve decided to set up shop in LA. and in even better news, they’ll be serving some of the menu items from their sister restaurant gracias madre (one of our favorite places EVER)!